In 2015, we wrote about giving WP Remote a new home. In 2017 we found the perfect buyer, and now we’re delighted to announce that the future of WP Remote is in the competent hands of the brilliant team at maekit. We sat down to speak to Matt Holme, CEO and Founder of maekit, and discover more about the team behind the brand, and their plans for a brighter future for WP Remote. maekit is a complete business solution for designers and creatives, enabling them to manage all of their clients under one roof. It’s a cloud based platform that handles the business of web design projects; from payments to website deployments and updates, security and associated domain names, maekit empowers creatives and facilitates the relationship between designers and their clients. With a proven and successful business model that enabled their Australian based web design agency, MyWork, to grow from a one-man-band into a team of 25, maekit has already gone through practical application and demonstrated its potential. 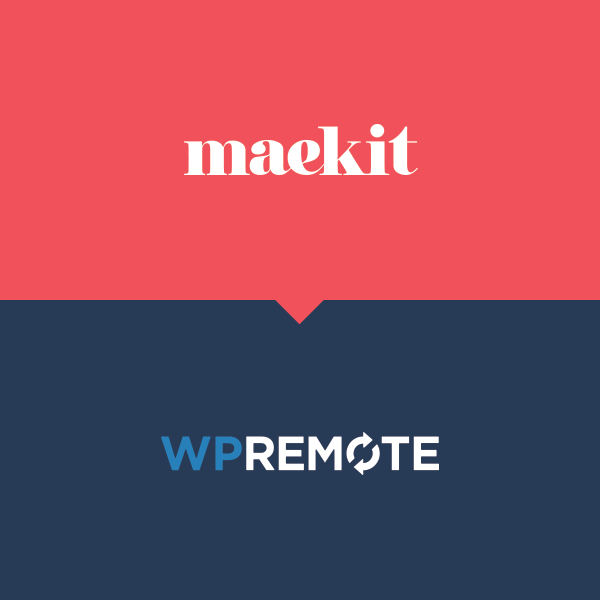 When we wrote about WP Remote deserving a better home, maekit realised it was a perfect fit, and a product they could integrate directly into their new platform. MyWork, the developers of maekit, are an Australian based web design agency offering a full range of affordable and professional design and branding solutions. With over 18 years combined design experience, their aim is to simplify complicated processes and help businesses take advantage of their online opportunities, from design to development and support. In 2009, they built a central solution to facilitate the business of managing WordPress websites. The platform, maekit, was kept and used internally for eight years and helped the agency evolve from one person to a full-service digital agency. Why did maekit buy WP Remote? Despite the proven success of maekit internally, the team at MyWork had been searching for a solution to add to the platform that would help them manage their existing client’s websites. Their accumulated experience of over 18 years as web designers meant they understood the pain points of their target user and recognised the value in the popular and active plugin. In addition, WP Remote had remained a much-loved product with its users and despite receiving no ongoing development it had remained an iconic plugin in the WordPress community. How does this affect current WP Remote users? One of the reasons we wanted to sell WP Remote was that we believed in the product, but we no longer had the internal resources to manage it. We were also grateful to our users and wanted to ensure WP Remote could continue to support a community of professionals who relied on it. One of the most important aspects of this handover, both for maekit and for us, is to respect the history and heritage of the product and the brand. For these reasons, maekit are committed to keeping the core features of WP Remote absolutely free. As web designers themselves, they respect the burden of work that goes into managing multiple different clients, and they want to find a more seamless way for designers to operate their businesses. WP Remote will exist as part of the platform, maekit, and it’ll look and feel exactly as it has done before; however, for existing users who don’t want to use any other feature of maekit, they can simply continue to use WP Remote as they have done previously. Phew! So nothing drastic is changing? For the time being, there is no plan to charge for any of the core features of WP Remote, and the interface still looks and feels the same. Existing WP Remote users are able to log-in from the familiar WP Remote login page and be taken straight into a dedicated WP Remote area. New users will be able to sign up via wpremote.com for the all-encompassing platform and make use of the additional features too. In fact, all of maekit’s features are free to use, and users are only billed once they’ve been paid by the client and elect to deploy a new website. 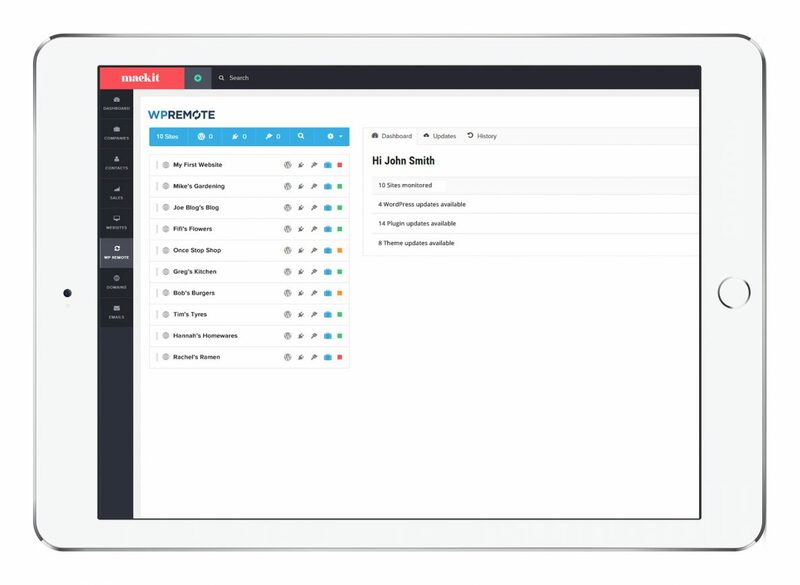 Existing WP Remote users will be able to benefit from the exciting features available to them through maekit; such as deploying new WordPress websites directly through the platform, and creating invoices seamlessly with secure payment gateways for clients. We’re delighted to be able to make this announcement and really excited to follow WP Remote’s progress as it continues to grow in the capable hands of the team at maekit. With similar backgrounds as the WP Remote user, maekit are in a prime position to offer further user-centred development and improvement. They’ll continue to work towards expanding WP Remote’s current feature set and are eager to hear back from users regarding how they can improve and grow the platform. Want to see all of this for yourself? Head over to wpremote.com and login to your existing account or sign up today.